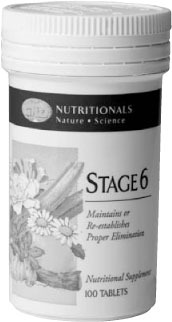 Stage-6 tablets were formulated to help people deal effectively with maintaining or re-establishing proper elimination. The formulation is a unique blend of herbs with time proven benefits and effectiveness. These ingredients are combined in Stage-6 to provide laxative and purgative actions safely, without the use of drugs or chemicals. In the intestine Stage-6 stimulates the natural secretions of the intestinal wall, relieving constipation and promoting intestinal evacuation. This relieves discomfort and creates the opportunity to re-establish intestinal regularity, promoting proper elimination. Take 1 to 4 tablets with a glass of water at bedtime. Take one or more glasses of water in the morning. Laxatives should not be given to patients with symptoms of appendicitis, intestinal obstruction, or abdominal pain of unknown cause, nausea and vomiting. Should not be taken continuously. When there is any doubt consult your medical doctor.